Botswana safaris – Get a quote & book your holiday here! On our tours to Botswana, you will experience one of Africa’s most exclusive safari destinations. Botswana offers unspoilt nature and impressive wildlife, on safari in Chobe National Park, for example. What’s more, you can combine Botswana with several of our other destinations, so you’ll return home with even more amazing experiences under your belt. Check out all our safaris in Botswana below. Our tours to Botswana offer highly authentic experiences. 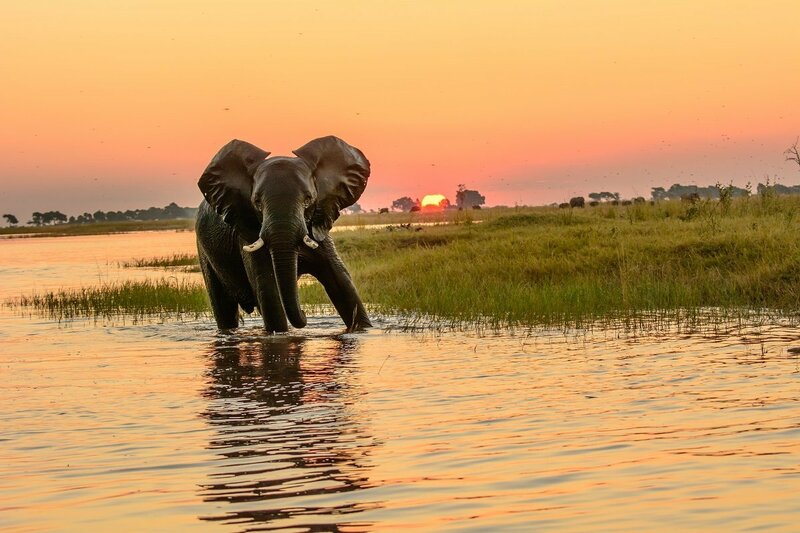 You should choose Botswana because you will find some of Africa’s most unspoilt and least visited national parks there, not to mention almost all of Africa’s famous animal species. Botswana offers unspoilt nature and exceptional safari areas. Close to 20% of the country is covered by national parks and wildlife reserves, giving you a great opportunity to experience the diverse wildlife. The Botswanan government has gone to great lengths to conserve the country’s nature by limiting the number of visitors to the country. Botswana is therefore also considered to be one of the more exclusive safari destinations. Chobe National Park is located east of the lush Okavango Delta. The national park is named after the majestic Chobe River, which gives life to the northern part of the Kalahari Desert, which forms a large part of Botswana. Chobe National Park is one of Botswana’s best safari parks. Due to government measures to limit the number of visitors, you’ll enjoy a private safari experience in the park – even if you travel there in peak season. The national park is home to the largest number of elephants in Africa, with up to 50,000 estimated to live in the park. In addition to elephants, you may meet large herds of buffaloes, zebras, jackals, hyenas, lions, wildebeest, giraffes, hippos and leopards. Chobe is also home to abundant bird life, with more than 450 different bird species, including the lilac-breasted roller, Botswana’s beautiful national bird. Chobe offers traditional safaris on land and river safaris on the Chobe River. We offer a wealth of combination options that will allow you to enjoy even more experiences on your tour to Botswana. 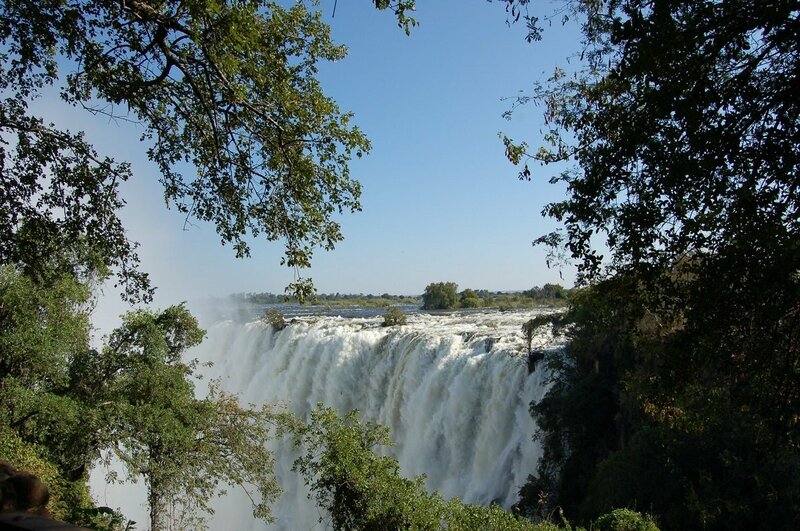 Combine Botswana with a tour to Zambia and see the spectacular waterfall, Victoria Falls. 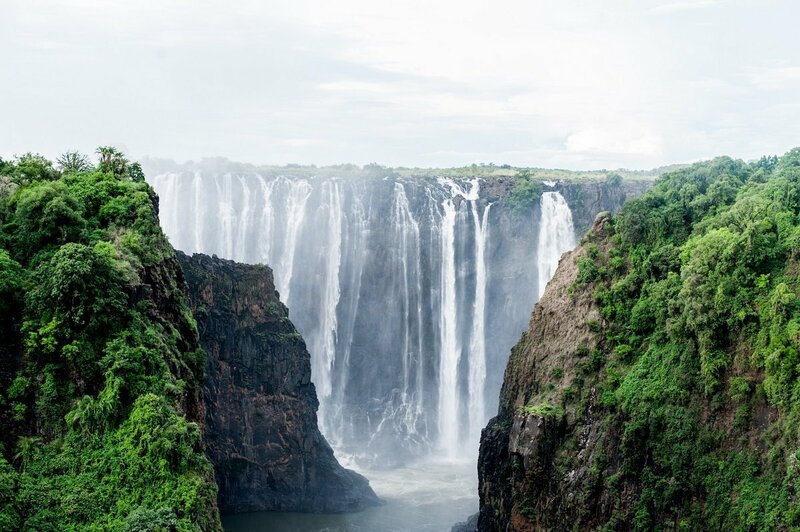 The waterfall is approximately 1.7 kilometres wide and consists of a total of seven waterfalls which send 500 million litres of water down into the 100-metre or so deep ravine – every single minute! It is an overwhelming experience to get right up close to the waterfall, on a walk on Knife Edge Bridge, for example. 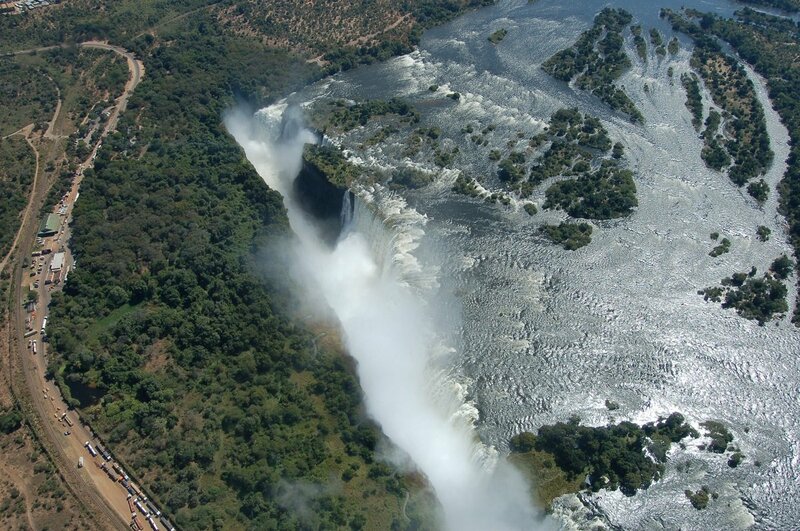 If you wish to experience the waterfall from a different angle, you can purchase a helicopter tour that gives you a unique perspective of the sheer scale of the waterfall. Read more about your optional extras on the tours. Combine your tour to Botswana with South Africa, which offers safaris, self-drive and city breaks. In Kruger National Park, South Africa’s largest national park, you will find a high concentration of animals, such as the Big Five animals, giraffes, zebras, gazelles and all the other amazing safari animals. On the south coast of South Africa, you can experience a little of South Africa on your own on a self-drive holiday on the Garden Route. The stretch offers diverse scenery with great contrasts between the nature on the coast and inland. 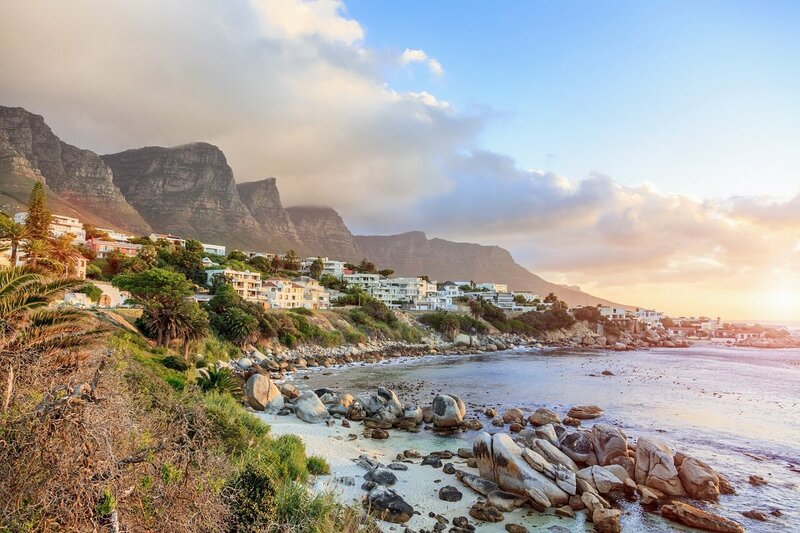 And discover Cape Town, one of the world’s most interesting cities. It is a modern city filled with exciting streets where you will find small shops, markets, museums and cosy cafés. Combine Botswana with a holiday in Namibia. Namibia stands, in many ways, in striking contrast to Chobe National Park as you will find dry landscapes here, and animals that have adapted to these more extreme conditions. Discover, for example, the sand desert, Sossusvlei, which is particularly beautiful at sunrise – experience it from a hot air balloon. Or Etosha National Park, which, in spite of the more extreme conditions, offers diverse wildlife with giraffes, elephants and lions. In Namibia, you can go on a classic tour or on a self-drive holiday. Round off your tour with a beach holiday in Mauritius – the stunning island state in the Indian Ocean. Mauritius is located in the Indian Ocean and offers relaxation by the bucket load by the pool or on the beautiful sandy beaches. You can also participate in various types of water sports or explore the island and get right up close to its lush nature. Do you have questions about Botswana? Botswana is a fantastic safari destination, and you are guaranteed to return home many unforgettable experiences the richer. If you have any questions about Botswana, the combination options or our other destinations, please feel free to contact our travel consultants, who are on hand to help you find the right tour for you. January–March: Rainy season in the north. Hot. Leaves on the trees can make safari difficult. Some camps in the north may be closed. Many animal youngsters and a lot of birds. April–May: The temperature drops slightly. The landscape is green. Generally dry. June–August: high season for safari. Chilly at night (it’s winter), hot during the day. Some places are getting dry, which means fewer leaves on the trees and the animals gather around the water holes. It is also now that the water hits the world’s largest inland delta: the Okavango Delta. Interestingly, the delta is not actually filled by the rainwater that falls in Botswana, but by the rainwater that falls over the mountains of Angola. September–October: Hotter, even drier, which means good chances of seeing the animals gathered around the water holes. November–December: The rain returns. It is often hot but the rain occasionally brings relief to animals and people alike, who perspire and need water.